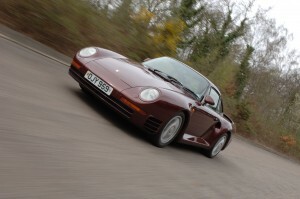 Porsche 959 – Supercar & still ahead of its time! Over the last 30 years I have been lucky enough to drive many interesting cars. Some have been on the track while most have been on the road. As you might have guessed, I am a “petrolhead” or for our American brethren a “gearhead”, or in plain English a fan of cars. Porsches have been a passion for a long time as you may have read previously. The fact that the cars are built to be used everyday plus perform at the highest levels, is quite unique. In the early 1990’s, I took a break from the intensity of the Porsches and bought a 1990 Mercedes 500SL. This is a very capable car and for someone who is more relaxed about their driving it is a great piece of kit. Today it can be bought for a very reasonable £6 -10,000 and as long as you can find a good specialist rather than a dealer to look after it, it does not need to cost an arm and a leg to run. Which is pretty good for such a nice 320 bhp convertible…..but I digress! After this I wanted something a little sportier and so swapped it for a Porsche 911 Turbo circa 1995. Known more accurately as a 993 Turbo 4 (based on a 993 body). Again a stunningly effective car but when I came to sell it, there was rather too much depreciation for my liking! So this set me off thinking….in my early days behind the wheel I had managed not to lose any real money on cars by fixing things myself and generally being careful about where I bought and where I sold. However with the Turbo, I had lost some money and although running a standard top of the range 5 or 7 series BMW would have cost more, I made a target to try and buy something I would enjoy driving AND would have a fighting chance of not losing too much money on. This pointed at once to something “classic”. At the time, about 2003, the classic car market was feeling the ill winds of the general economic slowdown after the dot com bubble burst so prices were soft. Of course I started looking at Porsches and thought about the 959, but the idea of owning such a rare and exalted be ast seemed as if it must be out of reach. 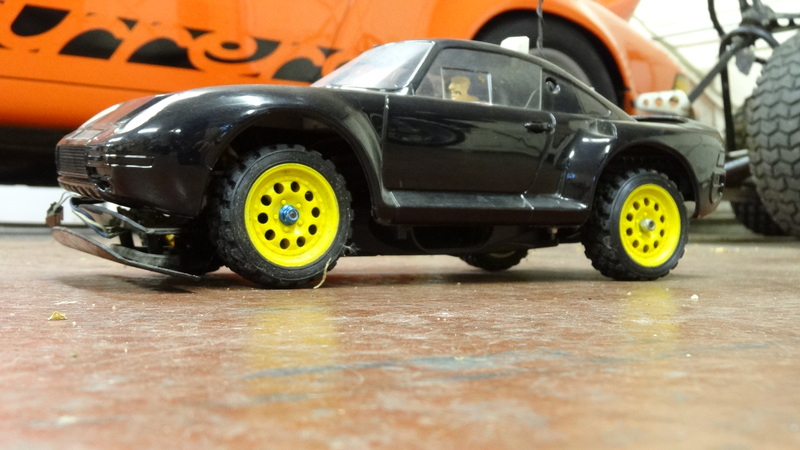 However on examination it seemed good value compared to many other cars at the time and it was a car I had always lusted after – in fact when my first son was born in 1987, the year the car came out, I “bought him” a high performance Tamyia model 959, which I used for several years….the model did make it into his hands but of course I let him drive it too young and the thing was pretty worn out by then anyway, so it died, although I do still have it and am waiting for some parts that could make it work again…..in case anyone knows a good source….!?! Next various other cars were considered such as interesting Ferraris, Jags and Mercedes but always with the same conclusion: the Ferraris & Jags were likely to break and the Mercedes, although a great make, does not excite and involve like a true sports car. 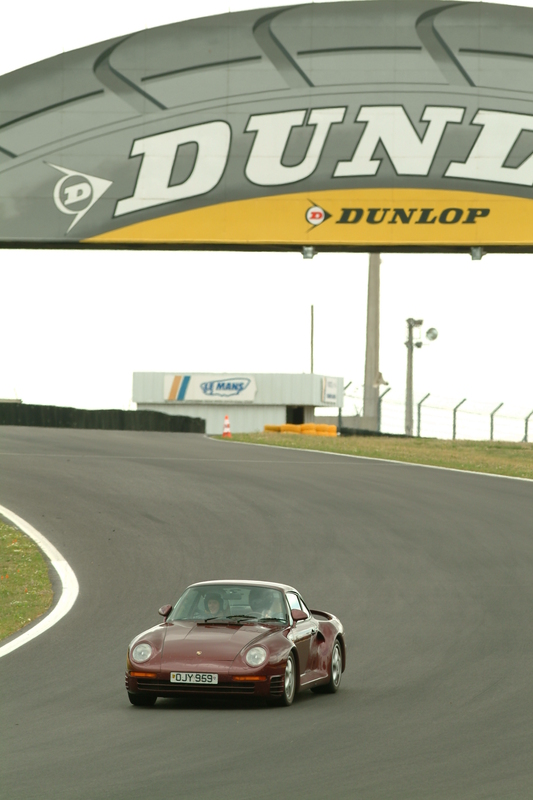 And so of course I ended up back at the start, thinking about the 959. On making a serious search, several turned up surprisingly quickly considering there were only 284 made in 1987 & 1988 (although I understand that Porsche did produce another 8 special order 959’s in the early 1990’s, the last one being registered to a certain M Schumacher!). I went to see the nearest and when I did see it I was captivated. The outside is over the top but the interior is very discrete and in fact is pretty much standard mid 80’s 911 – it certainly felt like going back in to my 1985 911. I found the car had an interesting heritage. 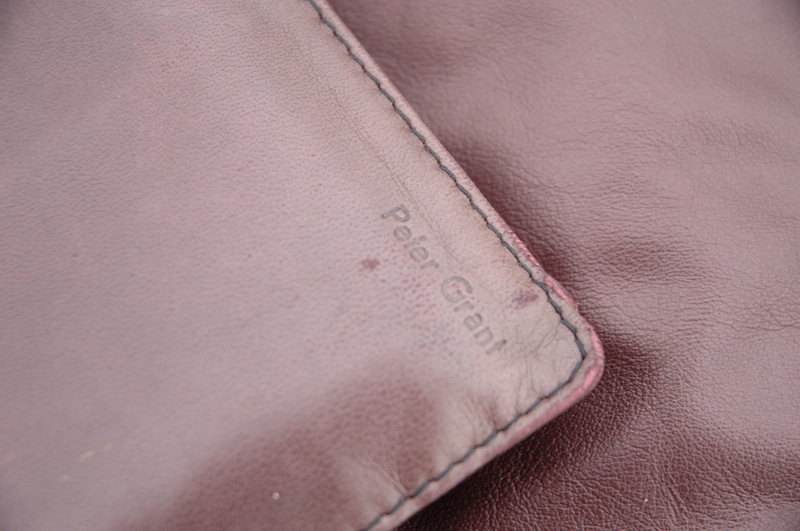 The original owner was Peter Grant, the late manager of Led Zepplin, who ordered the car in a special Weinrot (wine red) metallic colour with a special order interior tan leather with burgundy piping and trim. The normal 959 interior had three shaded horizontal stripes across the seats, I thought this one looked better. During the height of the late 80’s financial hubris, supercar prices of the day went up and up. I am told this actual car changed hands then for £500,000!!! I am glad to say very much more than I paid. In fact due to what was reported as something of a falling out between Porsche and the US government EPA, all the 959’s initially destined for the US were not allowed in bar one, not for road use. Hence there was something of a glut in Europe and in fact the UK had the most (I believe 35) – I don’t know why we had so many. I found the car in the showroom of a vintage Aston Martin dealer in west London. This gentleman is an excellent contact but honestly is not interested in anything as vulgar as a Porsche and was only selling it as a favour for a good customer….a certain Rowan Atkinson who bought it on something of a whim as it was the same colour as his McLaren F1. From what I am told, the car had been let go a little which with these cars can amount to a huge financial problem and in my opinion Mr Atkinson really saved the car by having a “money no object” service carried out. It obviously cost him but he did leave the car in very good shape for me! Thank you. OK – enough prevarication what is it like to drive? Quite simply the car is blisteringly quick. Even compared to the top supercars today the standard 959 is no slouch – circa 3.7 second 0-62 mph and a top speed just under 200 mph. Add to this the fact that the car is so easy to drive and you do have to be very careful to avoid losing your license. I can honestly say that you can do multiples of the speed limit in most places (as tested on a track only of course) and feel totally in control in any weather. 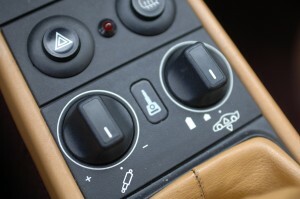 The car was the first sports car to have permanent four wheel drive, which was specifically built by Porsche to deliver power to the best place at the right time according to the demands you make with your right foot. The system has dry, wet, snow and off road traction programs and the microprocessor controlled system analyses the best thing to do dynamically while you are doing it. It was the first car, to measure the throttle inputs, steering inputs, yaw rate, take readings from the ABS sensors (again a very early adopter) and brake inputs and use all of this to keep traction at its best. As you can tell I am a true petrol head, but suffice to say that people far more knowledgeable than I say this is the best high performance four wheel drive system ever and the only reason it is not in other cars was that it cost too much to produce. Although the car cost £150,000 when new it is said Porsche still lost £150,000 per car as it had cost so much to develop. Other firsts were active ride height control, adaptive dampers and a body made largely of carbon fiber and Kevlar, all of which added to the costs. 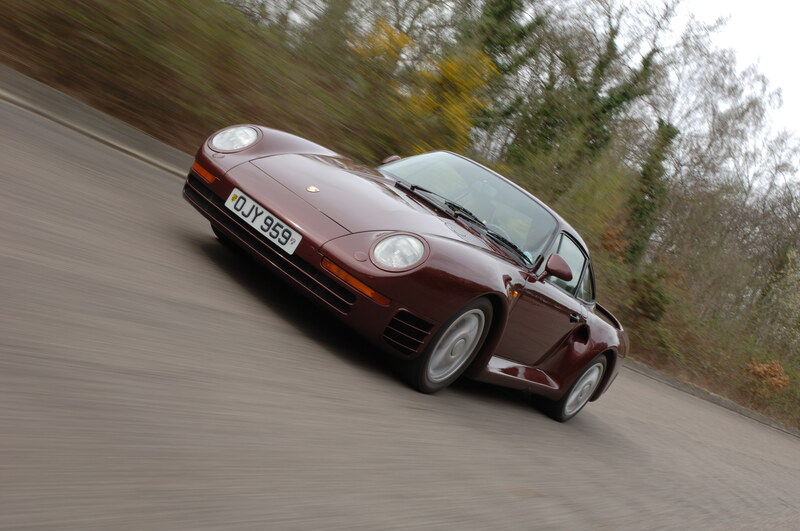 Even compared to some of today’s hottest cars, the 959 does not linger. Also it is the ideal companion for a long distance stint. It is comfortable, not too noisy unless you want to test its performance reserves, reasonably economical and handles all weather with the best of manners. The boot is little more than a glove compartment, especially if you carry the full tool set – in fact after I was told by one of the two individuals authorised by Porsche to service the car in the UK that if HE was to break down the only thing he would do was call a transporter and under no circumstances would he try to make a repair at the road side, I felt it was a bit point less to carry the tools, although they are quite a work of art, including white leather gloves to don in case of a roadside repair! But you can always stash a soft bag or two behind the front seats on the occasional rear seats, not ideal but ok if you love the car…..
About five years ago I upgraded the engine to the period factory option which now delivers about 550 BHP. I’m not sure what this does to the performance figures but it is seriously quick, plus more useable as the turbos spool up together which makes for less of a “power band” feeling when the second turbo used to come on line. Suffice to say that in fourth, when I simply put my foot down and a friend in his similarly powerful Bentley Continental GT put his foot down on, his the car “kicked down” but basically couldn’t see which way I’d gone (the only give away being the blue flames which come from the back of the 959 on the upshift if you take it to anywhere near the red line!). There is in fact very little to overtake this car in a straight line, the engine is a derivation of one of the most successful Porsche racing engines – and few, if any, companies have won as many races as Porsche, so that is saying something. 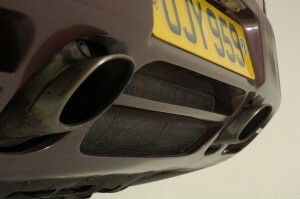 Hence although you have a full 550bhp on tap, the engine can easily produce even more. On the corners it is pretty good but I am not really an accomplished enough driver to test its limits. I have a video of the car in the hands of a professional at Brand Hatch before I got it and believe me it can mix it with the best even today nearly 20 years on! In the wet, the car makes you feel like a “driving god” to quote the Hamster. 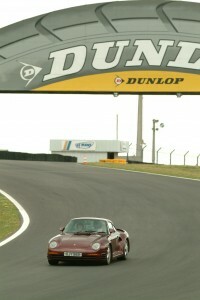 Versus an F40 at Spa, the 959 has his number all day until the rain stopped and my lack of skill became evident. By modern standards it is a little too high off the ground and of course the tyres are now thought to be too high profile. It uses proper run flats. In fact the wheels, pressure sensing system and tyres could fill an entire article in itself…hollow spoke magnesium wheels creating one chamber with the tyre itself, full direct pressure sensing in each wheel measured twice per revolution and tyres that when absolutely flat you can still drive home on, albeit better not at 200 mph!!! One great development is that Bruce Canepa, in the US, came up with the idea of importing a number of 959’s into the US and made road legal. Hence I believe twelve 959’s were bought, I think mainly from Europe, but I’m not sure, in any event some have sprung up there and now very few appear on the market here. As ever the normal rules of supply and demand apply, the prices have firmed up wonderfully and hence at present my theoretical net “cost” of ownership is negative, so at least I have hit my target. Not sure where I can go “automotively” from here, but for now this has been a most incredible amount of fun. The other true joy of the car is the amount of interest it attracts. From those “in the know” the first question is always the same “Is it real?” (there are a variety of replicas around) then get to chatting about all the details. From those who have no idea what it is, they think it is just some kind of car nut’s extreme body kitted 911 and hence try to ignore it completely. When I had my first car, an MGA, a German I met on a car ferry let me sit in their Ferrari 308 which I will always remember. 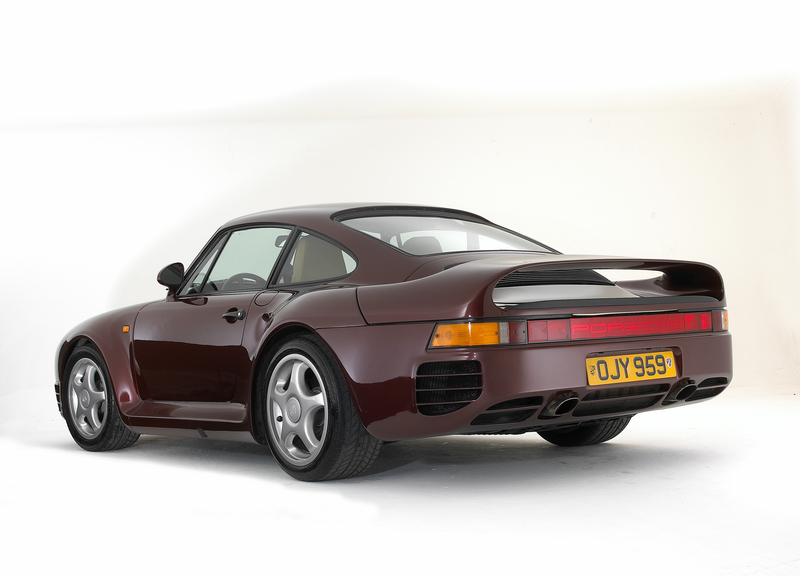 In future I hope that someone will remember being invited to sit in a burgundy 959 and realising this was the start of or at least a highspot in their lifelong passion………….